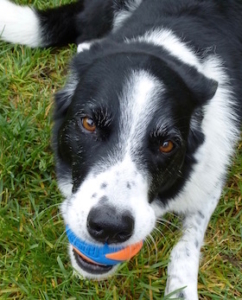 Border collie Seamus was adopted from an animal shelter in Montana. Handsome and bright, he needs rules, boundaries, a consistent daily routine, and far more attention than most people can give to even a demanding pet dog. However, given the right environment, Seamus thrives. Now employed as a skilled and highly-specialized conservation detection dog, Seamus is a complete master at locating any scent he learns. 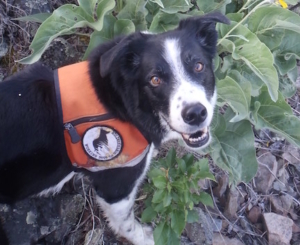 For several years now, Seamus’ outstanding ability to identify Dyer’s woad has been instrumental in the successful monitoring and eradication of the noxious weed from a Montana mountainside. He also works in California finding evidence of San Joaquin kit foxes and Blunt-nosed leopard lizards; both species are perilously endangered and very elusive. To further prove his skills, he has learned to search watercraft for aggressively invasive Zebra and Quagga mussels. He can suss out even the most concealed stowaways in the blink of an eye. When off duty, Seamus likes retrieving, retrieving, retrieving (did we say retrieving? ), sprinting EVERYWHERE he goes, chewing loudly on his favorite ball, cavorting in the snow, anything that involves water, being smarter than the average bear, and managing his human working partner. Best Friends No More Homeless Pet Network.